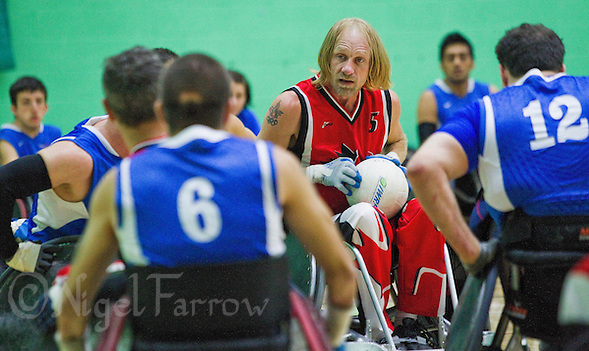 Described as a fusion of basketball, handball and ice hockey, wheelchair rugby is unique. 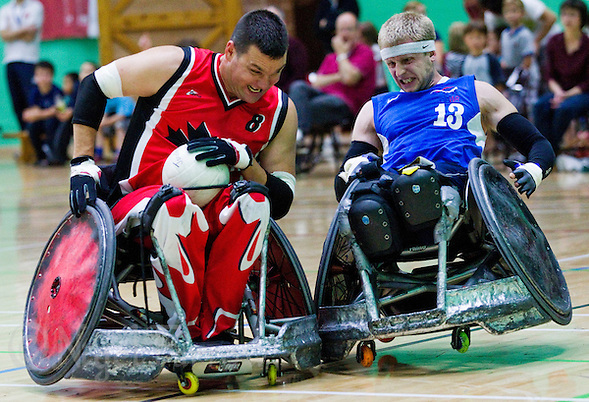 Parts such as tactics and blocking a wheelchair off the ball are reminiscent of American Football and Ice Hockey, scoring and challenges are similar to rugby and, the rules that keep a game flowing and relating to the control of the ball during play are like those for handball and basketball but, unlike other wheelchair sports, wheelchair rugby has no able-bodied equivalent. 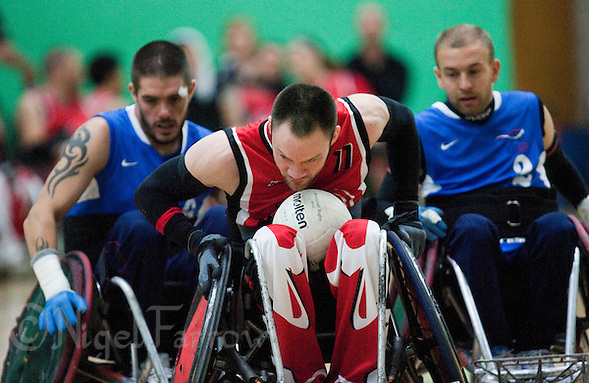 Originally called Murderball the sport was devised in 1976 by a group of quadriplegic athletes in Winnipeg, Canada who were looking for an alternative sport to wheelchair basketball. Due to their reduced arm and hand function they had found the existing sport left them unable to compete equally as their ability to dribble and shoot was less than that of those without restricted upper body function. 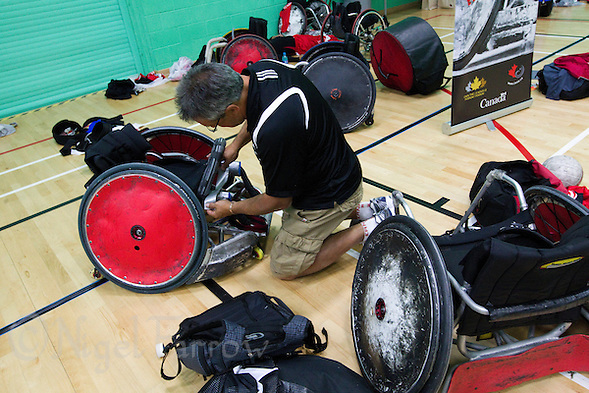 The sport still requires the ability to physically propel the manual wheelchairs that are used but a classification system allows for those with a wider range of disability to take part. Each player is assigned a point level ranging from 0.5 (the lowest functional level) to 3.5 based on how restricted they are. For example a player whose functions are reduced through multiple amputations will most likely have a higher point level than one with a spinal cord injury due to the former being able to have better control of their core muscles. Each team is then restricted to its four players on court having a total classification value no greater than eight points. Whilst men and women are classified equally and play on the same teams new rules introduced since the 2008 Paralympics in Beijing allow for a team to have an additional half point whilst using a female player on court so encouraging the use of female team members. Played on a regulation sized indoor basketball court the aim is to carry the ball across the opposing teams goal line. For the goal to count two wheels must be over the line and the player must be in control of the ball as they cross the line. The only markings required on the court are a centre circle and a key area at each end of the court similar to the goal area of a football pitch but measuring 8 metres wide and 1.75 metres deep with the goal line being the section of the court’s end line within this area. To avoid players just blocking the goal line no more than three of the defensive team may be in their own key at any time and attackers may not stay in the oppositions key for longer than ten seconds. 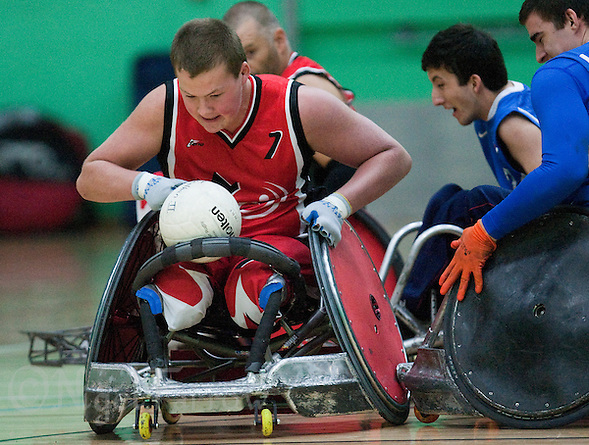 Whilst striking or holding an opponent will be penalised, physical contact between wheelchairs is a recognised part of the game with them modified to include a front bumper which is designed to help hold an opponents wheelchair, wings to make it more difficult to stop, an anti-tip device and spoke protectors to prevent wheel damage. 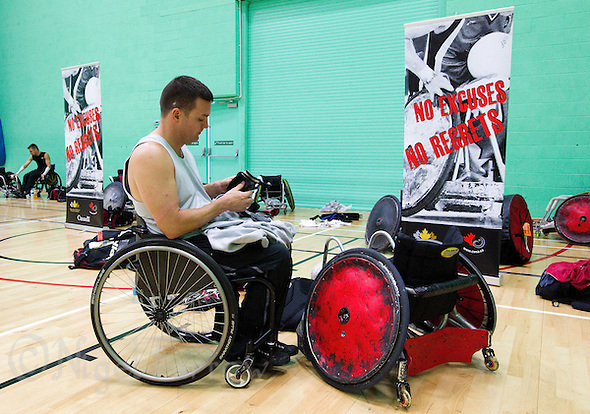 Whilst wheelchairs can be modified to meet the rules many players now use custom made wheelchairs some of which can cost in the region of £6000. Consisting of four eight minute quarters matches are kept flowing by only allowing teams 40 seconds to score before they must turn possession over to the opposition. In a similar fashion to handball to promote attacking the team with the ball must also move it into the front part of the court within 12 seconds, with each player either passing or bouncing the ball within ten seconds of taking possession. Over the years the sport has grown. 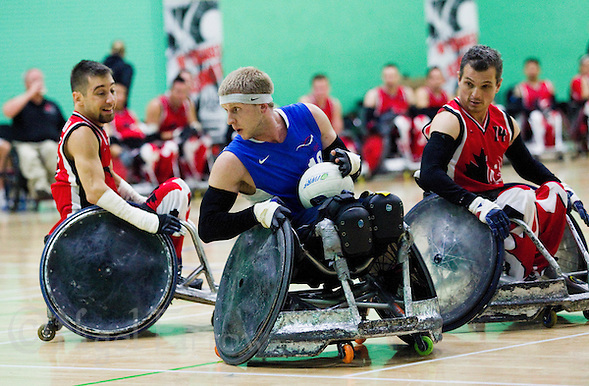 Now actively played in over 24 countries and under development in more, wheelchair rugby achieved recognition from the International Paralympic Committee in 1994 and finally made its first appearance as a full medal sport in the 2000 Sydney Paralympic Games with the US beating the hosts Australia in the final. 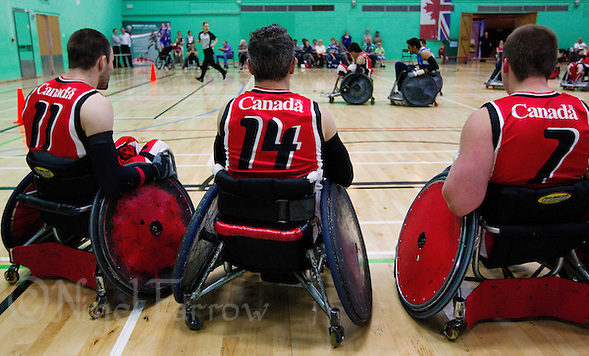 Since taking to the sport in 1981 the American’s, who call it Quad Rugby, have become the dominant nation winning four of the World Championships so far held, taking silver behind Canada in the other, and winning two of the three golds on offer at the Paralympics. Posted on Monday, August 15th, 2011 at 10:00 pm. 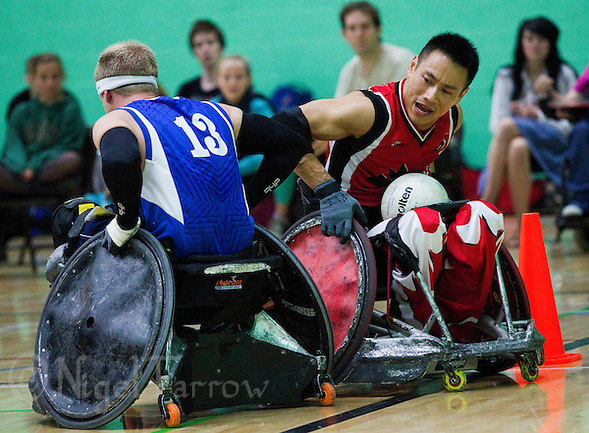 | Categories : Feature, Paralympic Sport, Recent, Sport, Wheelchair Rugby | Tags : aaron phipps, ian chan, mike whitehead, paralympics, rugby, sport, wheelchair, wheelchair rugby, wheelchair sport, zak madell.